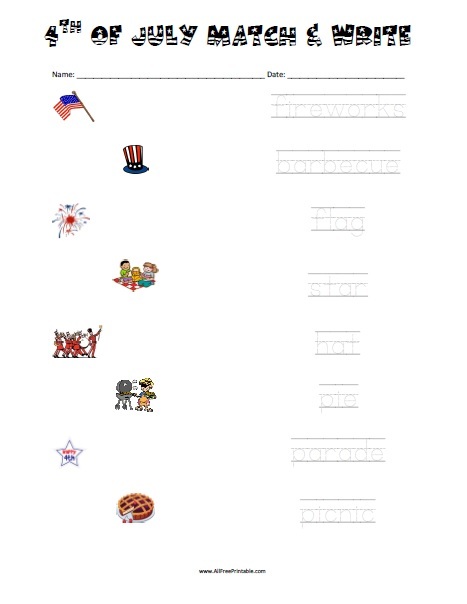 Free Printable 4th of July Matching Worksheet. Free Printable 4th of July Matching Worksheet, a fun game for United States Independence Day celebration and also to help kids practice writing skills. Share this free printable 4th of July Matching Worksheet at school, summer school or at home. Your kids can match the 4th of July images with the correct name and then practice writing skills. Kids can match 8 words like fireworks, pie, barbecue, flag, hat, star, parade and picnic. Print this 4th of July Matching Worksheet free and share with your kids and students. Happy 4th of July!